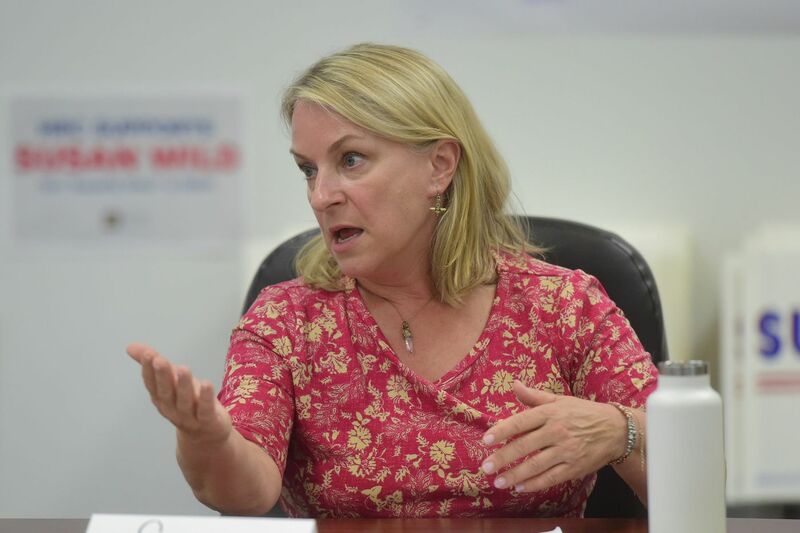 Susan Wild, the Democratic nominee for U.S. House in Pennsylvania's Seventh Congressional District in the Lehigh Valley, at a recent roundtable conversation with voters in Bethlehem. WASHINGTON — Democrat Susan Wild has a narrow lead over Republican Marty Nothstein in a nationally watched House race in the Lehigh Valley, a new Monmouth University poll shows — but she may lack the enthusiasm edge Democrats have seen in other contests. Wild leads 46 percent to 40 percent over Nothstein, among all potential voters — those who have participated in an election since 2010 or have newly registered — according to the poll, released Thursday. But her lead shrinks to 47-45 using a likely-voter model that accounts for historical midterm turnout; that is well within the margin of error. In the case of a Democratic surge, her lead is 48-44, also within the margin of error. Which Pa. and N.J. House, Senate races will make the difference in the fight for Congress? Independent election analysts see the closely balanced district as one of Democrats' top pickup opportunities as they try to win a House majority. Wild, a former Allentown solicitor, and Nothstein, a Lehigh County commissioner and former Olympic gold medalist in cycling, are competing for an open seat formerly held by Republican Charlie Dent, who retired earlier this year. The poll shows a closer contest than some Republicans have projected. Privately, several GOP insiders in recent weeks have raised concerns that the race may be slipping away from them, given Wild's fund-raising edge and the overall Democratic enthusiasm. That enthusiasm, however, did not materialize in this survey: Voters in both parties showed roughly equal interest in the race. "This is the only race we've polled this year where the enthusiasm gap does not favor the Democrats," said Patrick Murray, director of the Monmouth University Polling Institute. The candidates are unfamiliar to voters, suggesting that there is significant room to maneuver. "Monmouth has polled 10 competitive House races so far this cycle," Murray said. "This is the first one where the Republican candidate's prospects improved by more than a point when we applied our standard likely-voter model." Most voters — 61 percent — said it was important to cast a vote that shows their feelings about President Trump. His approval rating in the district was roughly evenly split. The poll also found that a sexual-misconduct investigation into Nothstein — which he firmly denied and said he was cleared of — has not made much impact. Only 45 percent of voters in the district said they had seen or heard news about it and few (4 percent) believe he engaged in misconduct or likely did (10 percent). The poll surveyed 401 voters from Sept. 5 to 9 and has a 4.9 percentage-point margin of error for the full sample and a 5.7 percentage-point margin for the likely-voter models. The margin of error for the candidates' leads is 6.8 percentage points for the full sample and 8 percentage points for the likely-voter models.